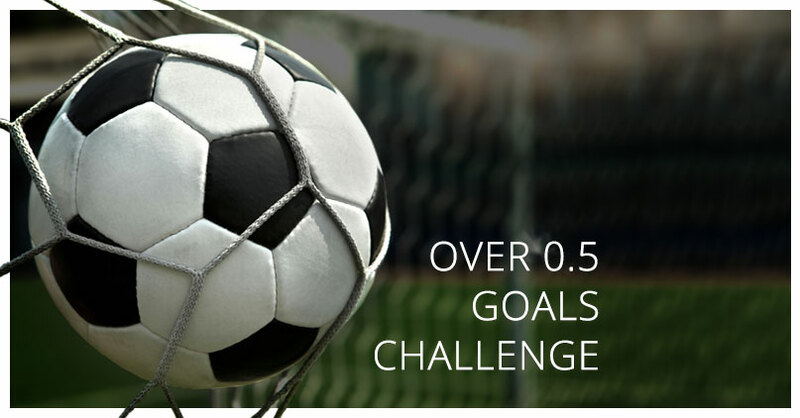 Over 0.5 goals challenge strategy is one of the most interesting, secure and at the same time much profitable strategy. How many times have you bet on a highly-favored low-odds team to win a match and your bet was a losing one? With this strategy you are not interested in who is the favorite and who the outsider, all you need is at least one goal in the entire match. Choose a match in which you think there will be at least one goal, place your bet and win. The first time your profit will be insignificant. What then? Choose the next match and make the same bet with all the profit acquired. Repeat this twenty times, pick all the winnings and strat from the beginning with the original bet size. It’s important to know that in order for the strategy to be successful, you must place bets at a minimum odds ratio of 1.10. In this case, you can wait 10-15 minutes after the start of the match of your choice and if the result is still 0:0, place a live bet. We’ll give you an example of how much you can earn with this strategy. Let’s say you have a bank of 100 euro and you place a bet for over 0.5 goals on 1.10 odds ratio: then you’ll have 100 x 1.10 = 110 euro, but when you do it 20 times: 100 x 1.10^20 = 672 euro. If you are a little bit of a patient and wait for the odds to rise to 1.20 then things look like this: 100 x 1.20^20 = 3833 euro. You make a profit of 38 times your initial bet! It sounds great, isn’t it? And you only need a goal in the match. Be patient and choose carefully your matches and your success is guaranteed! With an average of 4.7 goals per game, Australian Leagues are the most successful. It’s direct, attacking and performing football, so you can give a look at the matches if you decide to try Over 0.5 goals challange strategy. With approximately 4.2 goals per game, the Canadian Championship is the second most successful. Weak defenses, the abundance of mistakes and multiple goals. What better than that? With an average of 4.04 goals per game, Norway 3.division takes 3rd place in the matches from all championships. Do not miss them! With an average of 3.67 goals per match, the Latvian Championship is the place you should pay attention too! During the last season of 480 played games, there are only 8 games that ended with 0:0.